Taft-Peirce SINE BLOCKS by Suburban Tool, Inc.
Made of high-quality, heat treated alloy steel. Top surface precision-ground, flat and square with sides, and parallel to sine rolls. The rolls are ground and lapped alike for diameter, roundness and straightness, and parallel to each other within the limits specified below. 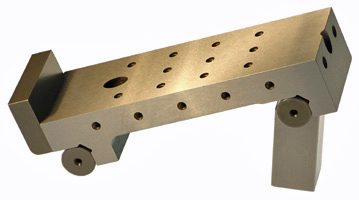 Precision-ground end plate acts as a work-positioning stop. All sizes furnished in a finished wood case. Tapped holes in the top surface and sides allow a wide variety of work-clamping set-ups.